Piers Francis, Tom Collins, and James Haskell have all been included in Chris Boyd’s starting line-up to face ASM Clermont Auvergne on Saturday, while lock Dom Barrow will make his Northampton Saints debut in Saturday’s European Challenge Cup curtain-raiser. The men in Black, Green and Gold will bid for their third Challenge Cup title, having won the competition in 2009 and 2014 – the only two other seasons in which they have been involved. A big test awaits Boyd’s men first up however, with Saturday’s opponents Clermont currently sitting at the summit of the Top14 standings in France after seven rounds across the Channel. Saints welcomed the French giants to Franklin’s Gardens last season in the Champions Cup, and will hope to repeat the impressive 34-21 triumph they achieved back in January on Saturday (kick-off 3pm). Director of rugby Boyd is able to welcome inside centre Francis back into the No.12 jersey after the 28-year-old successfully completed his return to play protocols this week. Francis joins Andrew Kellaway in midfield, and despite the half-back axis of Dan Biggar and Cobus Reinach remaining unchanged, there are more adjustments in the back three with Collins regaining a starting berth. Boyd sticks with the same front row that took to the field against Leicester Tigers last weekend, but Barrow will make his Club debut in the engine room after signing from Saints’ east-midlands rivals over the summer. Haskell returns at flanker for the first time since mid-September to add some ballast to the back row, and there is room amongst the replacements for Academy lock Alex Moon – who will make his European debut should he enter the fray from the bench at Franklin’s Gardens. Edited 2 time(s). Last edit at 2018:10:12:11:40:27 by tedge. Une image mais pas des mots! Edited 1 time(s). Last edit at 2018:10:12:11:42:26 by Matthew. That's pretty much my pick of the back line, with big T off the bench to run at tired legs and bodies. Back row looks a heavy unit too with Hask in and great the see Francis back. Would have expected to see more rotation at prop, 9 and 10. However, looking at the group I guess this is the game to win. Would this be Barrow's debut for us? Very pleased to see Haskell and Barrow back in contention. Will add some much needed bite to the pack. Also pleased to see Craig not listed amongst the injuries, hopefully he can be back in contention soon. A shame to see Eadie drop out of the picture IMO and also to see Waller to start again. Save for one or two, the majority of the squad picks itself due to injuries. They did say mid week they were preparing for a strong Clermont side. I do wonder that’s why we are not seeing Mitchell Grayson and Haywood in for starts yet. Perhaps that will change for Dragons. Edited 1 time(s). Last edit at 2018:10:12:11:53:02 by Wilson Pickett. Not looking forward to scrum time! About as strong as we can be given injuries. Looks like it should be dry tomorrow, so I hope we can move their big forwards around. I thought I read on here earlier in the week someone predicting that Clermont might bring a weakened side? Blimey! If that's weak- I'd hate to come up against their strongest side! Well, It's missing Parra, Lopez, Raka and Fofana to be our strongest side. But Azema had clearly said that we would play this competition in order to win it. Where is Taqele? Not playing and not listed as injured. Surprised that he is not on the bench at least - a better finisher and cover option than Luther I would have thought (especially as Harry can cover centre). Taqele is probably getting a rest whilst he gets up to fitness. He missed pre season so will need managing whilst he gets towards the weight the coaches want him to be. He should be fresh as he hardly broke sweat last week. I doubt he is fresh, he played a whole season of Super rugby and came over after just a few weeks off, so maybe he is being rested and rotation being used? This really is a must win match. Start with a home loss and we are on the back foot straight away. I don't have a clue about how player registration works, but given that Taquele didn't start playing for us for a few weeks could he be non registered for European matches? No doubt I'm wrong but like I said I don't know how the system works. As he was under contract and just arrived late I don't think that would be the case, Ramsey. I'd have to fancy Clermont to win this one sadly. Clermont are top of the Pro 14 for a reason and they want to win this competition and have picked a helluva side. No bad having a British Lion scrum half as your reserve scrum half! It does look like a Champions Cup side against a Challenge Cup side. Having said that the French don’t travel so well and we beat them at home last season. Whether or not the competition is important for Saints this season, I do feel that it is important for the side to get a win. Clermont last season were a shadow of their form this season, check the Top14 table. Yes, the French sides are usually easier when they have to travel but most of that is because they tend to rotate away from home keeping their top team for home games. 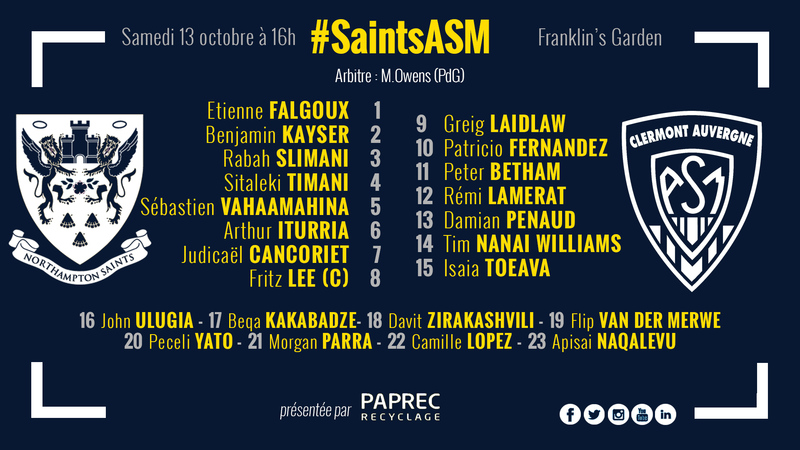 La Rochelle murdered them in the scrum in the 1st half last weekend but the likes of Slimani is in their starting XV for this game. Without stability at tight head we will struggle,Aaron Painter will come good in time but Paul Hill can’t return quick enough. Franks may be a 2 times World Cup winner but age and physical ability is limiting his scrum game. Boyd needs to stand up and take the reins, whilst we have the majority of last years coaches still in power what really is going to change? With England calling our leadership will disappear so let’s make changes now and let the players left to hold fast take over now. you have to select the England players when they’re available, or why bother having them?